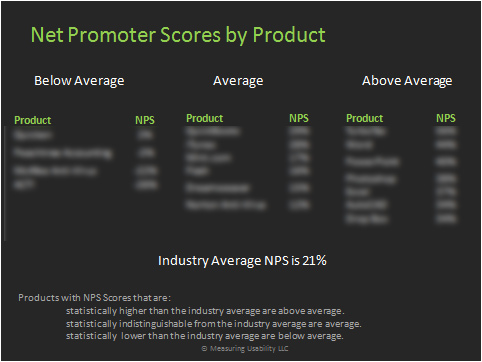 A comprehensive benchmark report with Net Promoter Scores, Usability Scores, Key Drivers and Analysis for 17 consumer and productivity software products from over 1700 current customers. 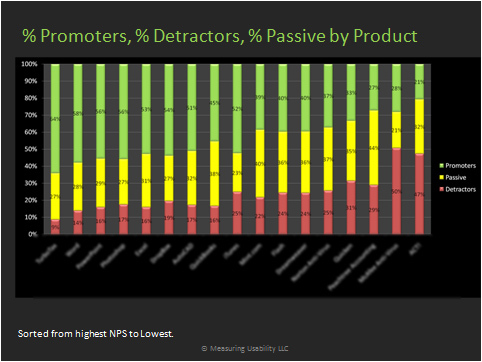 Net Promoter Scores: Product Net Promoter Scores, Promoters, Passives and Detractors by Product along with confidence intervals around the sample estimates. 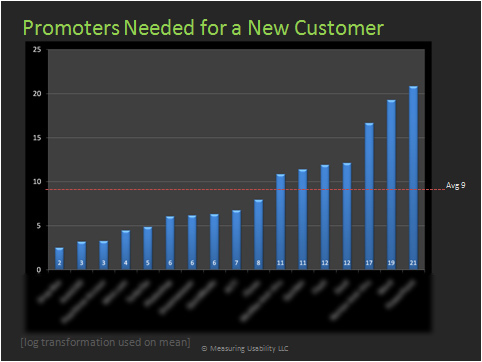 Usability Scores: Perceived Usability is a key driver of customer loyalty. 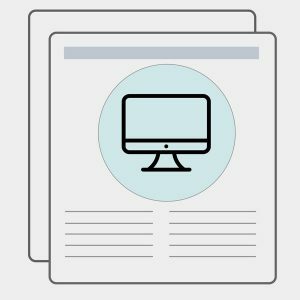 The System Usability Scale (SUS) is a standardized usability questionnaire widely used in software usability. The report contains both raw SUS scores and converted percentile ranks and letter grades. 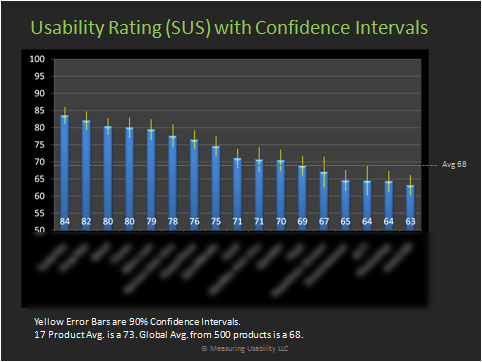 Learnability Scores: A break-out of items 4 and 10 from the SUS questionnaire provide a measure of ease of learning by product. 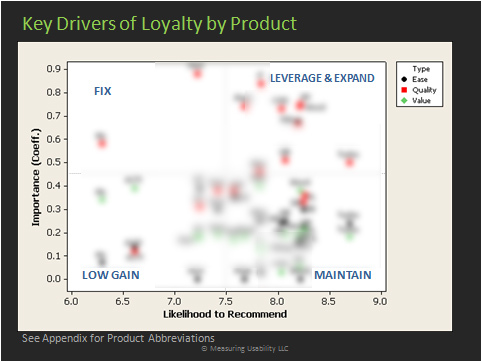 Referral Rate by Product: The percent of users who were referred to the product from a friend. Retro-Recommend Rate: The percent of users who report having actually referred the product to a friend in the last 12 months. Promoters Actually Promoting: Not all promoters are created equal. 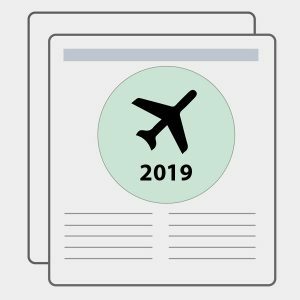 The report also includes an analysis of the percent of promoters by product who also reported recommending the product in the last 12 months. 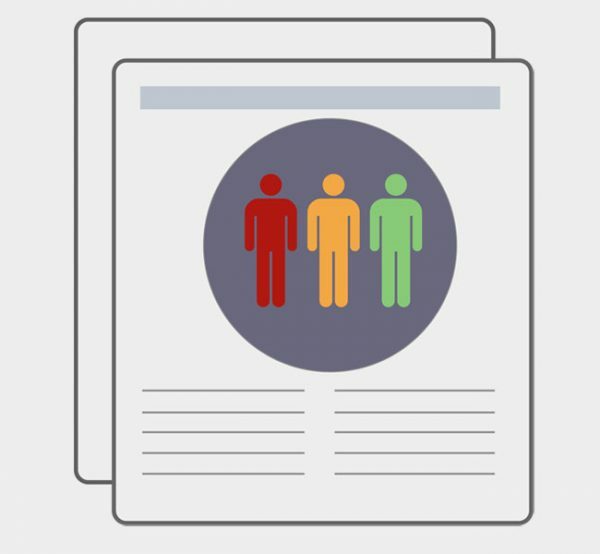 The Value of a Promoter: By combing the referral rate, retro-recommend rate and promoters who recommended, an estimate of the number of promoters needed to generate a new customer is provided by product. 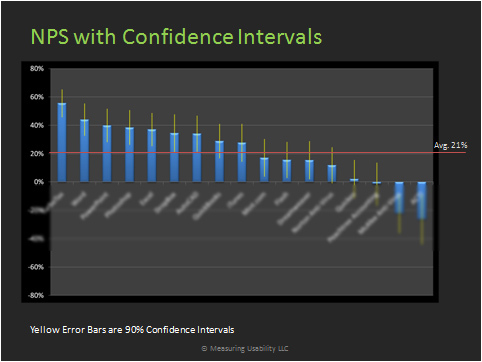 In addition, the lower boundary of the confidence interval is used to generate a conservative estimate which may be better for planning and forecasting.